Tickets for the Fat Quarterly London Retreat go on sale this Saturday at midday UK time. The weekend will run from lunchtime Friday 19 July to lunchtime Sunday 21 July and will cost £200. Although we have not yet finalised the class lists, I have decided on my two classes. Having attempted to teach three different foundation paper pieced pillows last year, I have decided to keep it simple this year. One FPP star block. It's a lovely quick and simple one to FPP so suitable for beginners. I've also taken on board last year's feedback that you'd like to be able to finish what you start in the class and this block can be done in three hours with the benefit of my in-class speed FPP tips. Although I've made this pillow with a very simple colour scheme (using Sweetwater's beautiful Sew Mama Sew line paired with Essex Linen), it would make a great scrappy pillow and I'd even love to see it made without the background strips in between the stars so much much scrappier than this version. Please let me know if you're planning to come to the London Retreat and, if so, what you'd love to be taught this year. I'd be up for making one of those, no idea what else I might want to do though! Ooops, forgot to say, I would actually love to make that cushion! £200 - I was thinking it was going to be $200.... That's a whole £100 more than last year. Love that pillow and will be buying my ticket on Saturday! I don't know what I want to do - but suspect there will be a lot of chatting involved! And a bit of swearing at the sewing machine! The pillow is beautiful! Do many people from the U.S. come to the retreat? I've never been to England at all, and would love to make the trip. 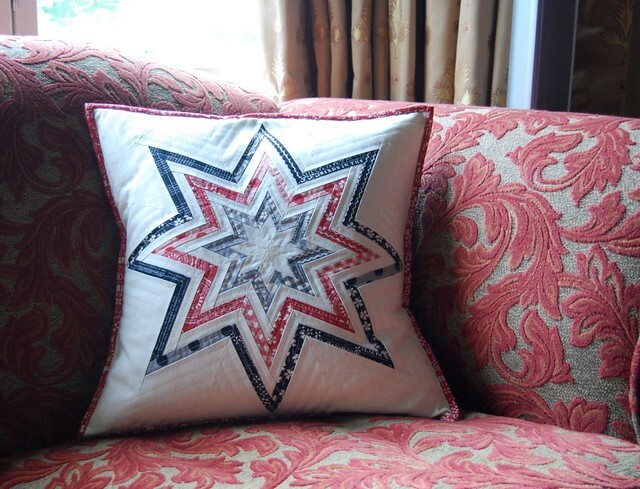 It's a gorgeous cushion - sounds like a fabulous class to teach or take! I'd love to come if only it weren't such a hike! It looked like so much fun. I'm coming and would love a FMQ class I will not be flying with my machine. Are there machines to use? I need to learn how to make an even 1/4" seam... Can you teach me that??? Otherwise I'd love to learn some more "advanced" techniques, like y-seams and curved seams. It's a stunning cushion - don't think I will be able to make it sadly :-( But will look forward to reading all the blog updates about it again! Me me, I want to make one! wish I was closer and could participate... still fun to see pics tho! I love that pillow case! Wish I could come to your retreat- so fun! LOVE the pillow Lynne. And I don't know when you did your header but it showcases your beautiful work just right!